We all know that speed is one of the most important factor for the success of a website but why? A faster website helps to improve the conversion rate, reduce bandwidth cost, increase your site ranking in search engines (Google, Yahoo, etc), improves user experience as well as user retention on your pages. How to check your site performance? Is it well optimized? It’s quite easy to check how your site is performing, if your site loading time is high then the performance is bound to be low. However, loading time can be affected by many things even the internet connection of yours can make a good site load slow. 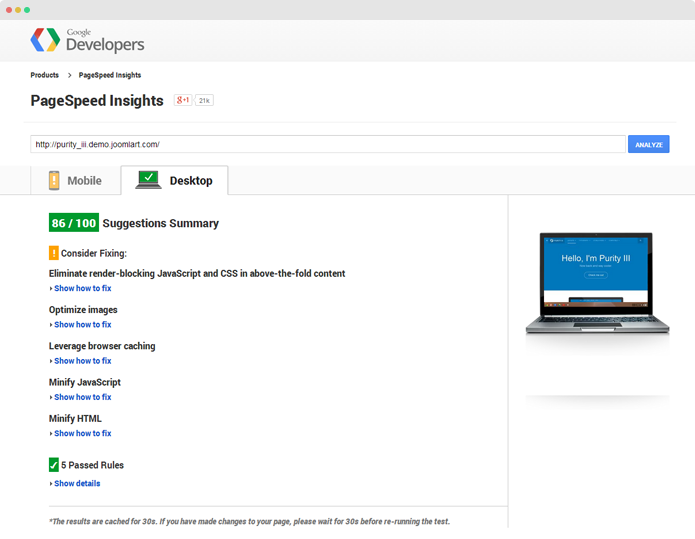 Best is to choose online tools to check such parameters, there are lots of such tools, I select Google PageSpeed insights. The tool provide the overall status of your site, analysis in provided in detail and even the suggestions to fix the found issues. 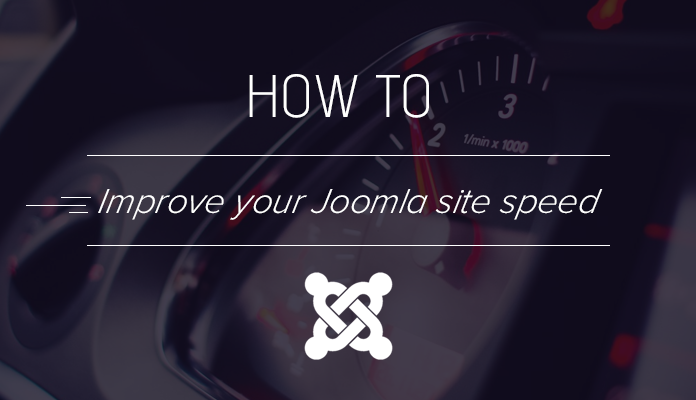 Here are the tips the help improve your Joomla site performance. When a visitor loads a page in Joomla site, Joomla fetches content from database, loads extensions (modules, plugins, components) required in that page and template files, which then renders as a single page, thus the whole process takes time. Those things can be solved by Joomla caching system. Once the plugin is enabled, the first time someone loads a page, the result from the process above are stored and the visitors then get the stored version of that page instead of repeating the whole loading process. 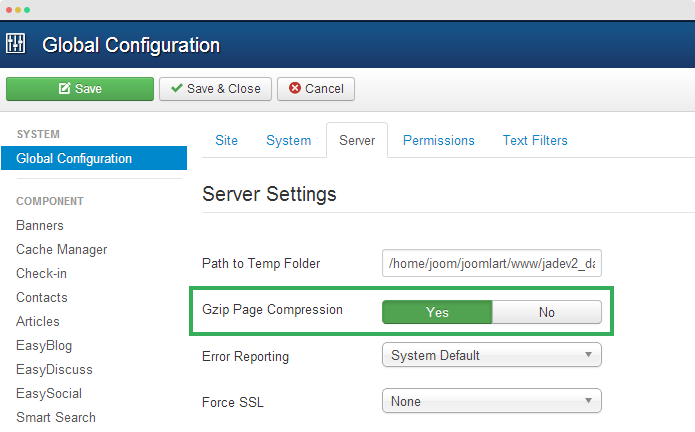 There are 2 steps involved to enable Joomla cache. 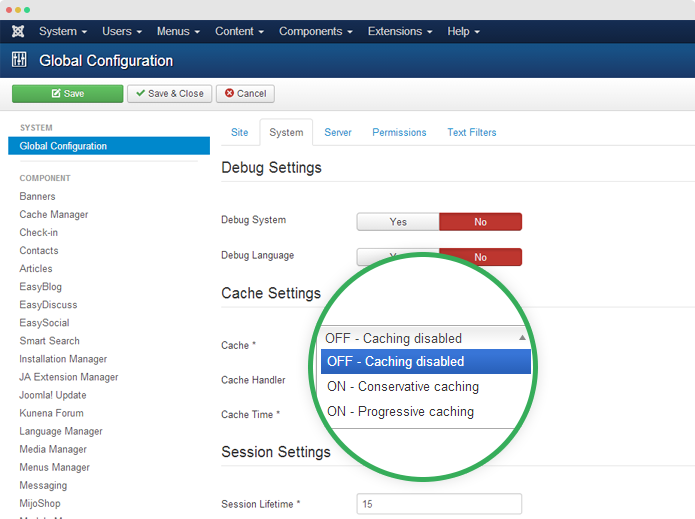 Please navigate to: "System → Global Configuration" then open the "System" tab where you can find the "Cache Settings", select the Conservative caching or Progressive caching. What cache mode to select? Please go to: "Extensions → Plugin Manager" then search for system cache plugin, enable it. The option compresses your site before it is transferred to visitors, this will reduce web page size then make the page load faster. To enable the option, please go to "System → Global configuration → Server → Server Settings", find the option “GZIP Page Compression” then enable it. In your site, you can use many extension that handle different functionality but be aware of choosing extensions, some extensions, which are not optimized can slow down your site. 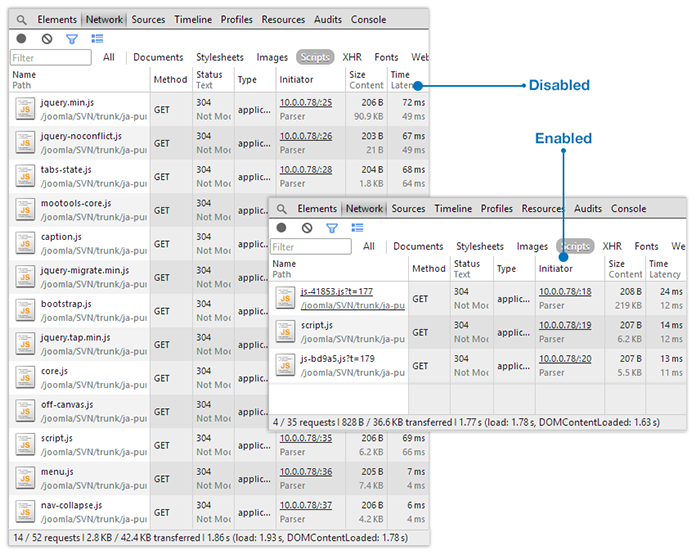 Also, more extensions you choose to display in front-end, the more HTTP requests they will require to render. So keep your site as light as possible for better performance. Its a simple math, if its heavy it is bound to take time to load. Don’t use large image and don’t add too many images to a single page. CDN stands for content delivery network, it is an interconnected system of cache servers that use geographical proximity as a criteria for delivering Web content. A content delivery network helps speed up your website a lot by shortening the distance between the person visiting your site and the server delivering the content. CDN is especially well suited for delivering media such as: video, audio, images, etc. So instead of loading those media from server, it loads from CDN, it's more efficient and reliable. There are many extensions that can help you with this such as JA S3 Amazon or other content networking extensions on JED. CSS and JS optimization is the process of removing unnecessary or redundant code in CSS, JS files to reduce file size then joins CSS and JS files then number of requests will be decreased. In the General setting of the framework, enable CSS and JS optimization, you can exclude files for optimization then save setting, that’s it. A template or extension extension with good design is not always the best choice. There are other factors you should consider such as its features, its usability, is it friendly with Search engines, is it sleek and optimized, etc. Responsive designs are trending now, your site must look great in most widely used devices: tablet, mobile and well performed in those devices. 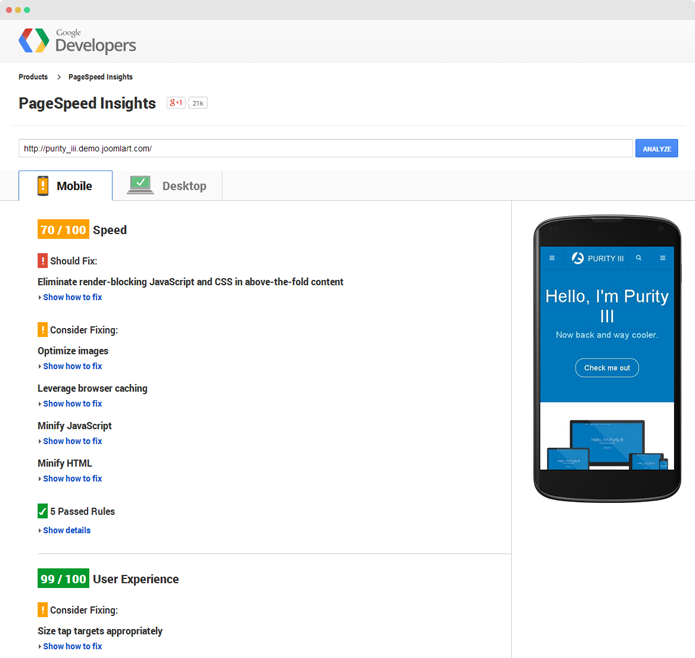 You can use Google PageSpeed insights to check how your site is performed in mobile and list of issues should be fixed. 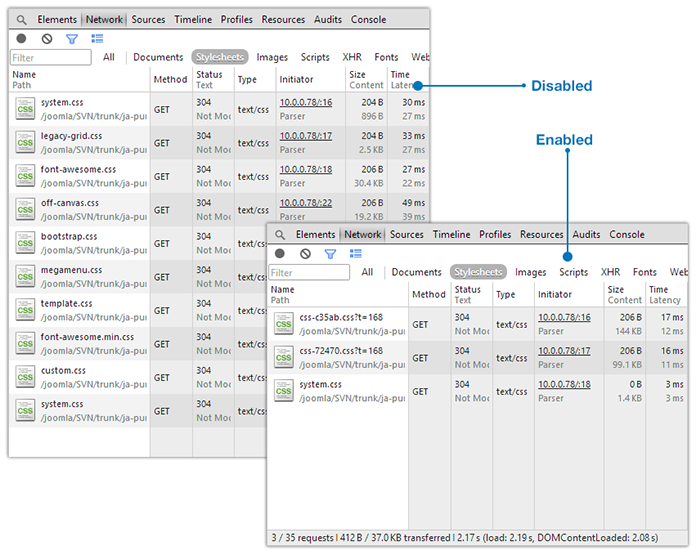 ETag - tells browser to fetch image (that has already downloaded) from the local browser cache instead of server. Good web host can improve your site speed significantly. Choosing a web hosting that is best suitable with your site demand: web space, monthly traffic, data transfer, backup, database type support, CDN, etc.